IT is quite amazing to walk into the Shepparton Uniting Church on Fryers Street and see a new display that depicts crosses from religions around the globe, and all just in time for Easter. Rev. Rosalie Raymont-Hewitt and Joan McRae from the church have put together 31 posters that show crosses from various religions, with the posters including an image of bible reading, a reflection piece, the story of the cross itself as well as interactive activities that people can take part in such as cross colour-ins and making the cross out of various items. Joan said, “Everyone thinks they are fantastic. “They are all quite different, which is interesting. “Rosalie has done something like this before and with space to display them in our new building, we thought it would be something great for the wider community to enjoy on the lead up to Easter. Shepparton Uniting Church is located at 134/140 Fryers Street, Shepparton and is open from 10am to 3pm, Monday to Friday and worship in from 9:30am on Sunday. 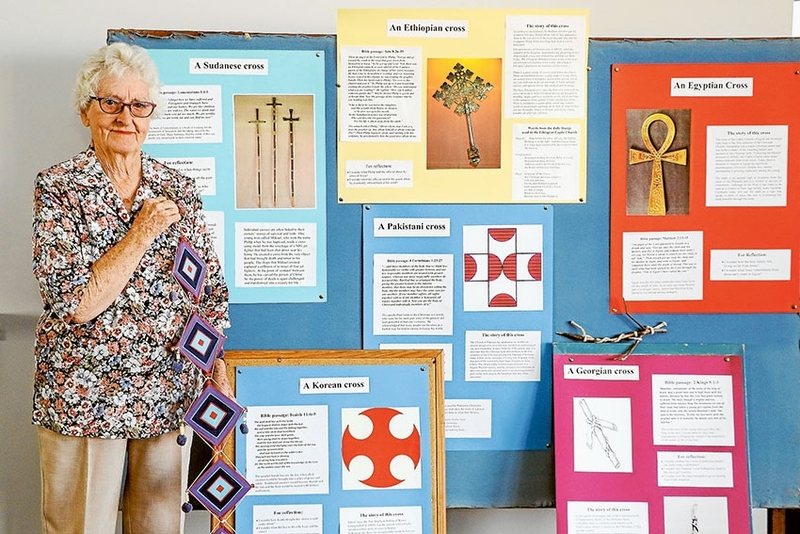 MASSES OF CROSSES… Joan McRae from Shepparton Uniting Church holding the Latin America (God’s Eye) Cross, which is one of 31 crosses on exhibition at the church. Photo: Katelyn Morse.